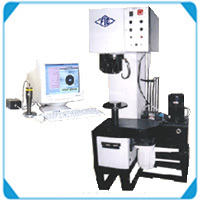 FIE Computerised Brinell Hardness Tester, Model B 3000-PC-FA is fabricators from steel plates and is designed for precise loading systems. It is fully automatic machine for production testing,. Once the job is placed on testing table and a push button for operation cycle is pressed, the job is raised and swiveled and brought in contact with claming device. Then indentor is swivelled and brought in vertical loading position .